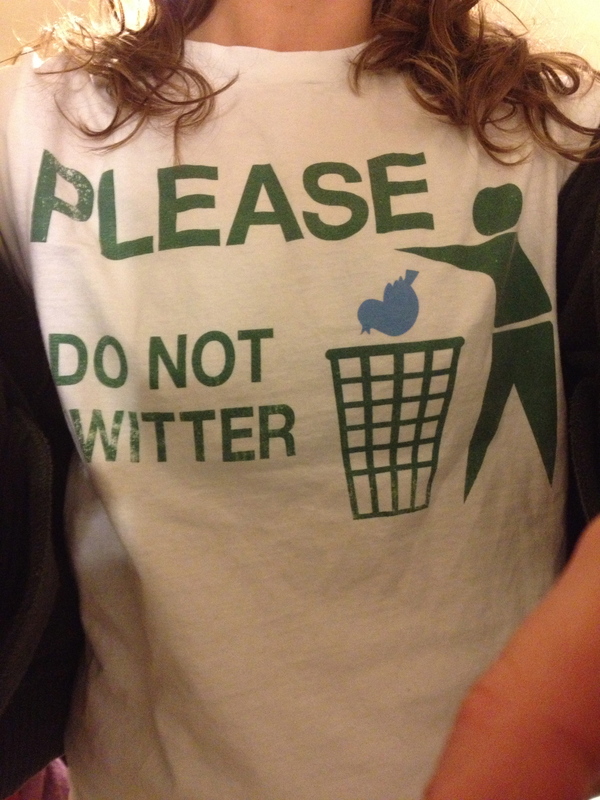 For the past month or so, I have been doing volunteer work at the People’s Food Coop. 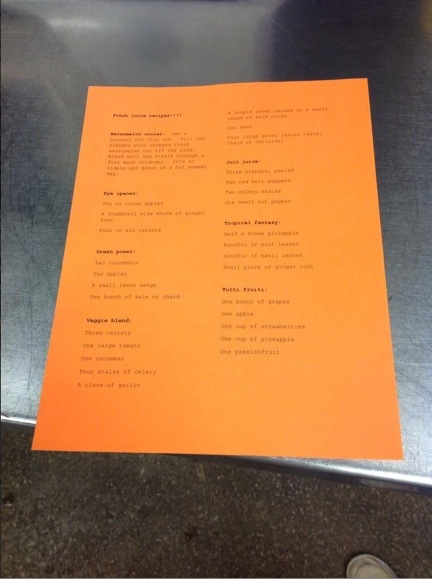 I attend their cooking classes, take pictures, and tweet about them to help spread the word of these awesome cooking classes and the Can-Do Kitchen. Last night was the Get Juiced! class – where we juiced it up. I had attended this class back in January, when my ex and I were thinking about incorporating a juice bar into his brewery (the juice isn’t happening, but the beer is, and I’m not involved anymore). So, I have memories of going to juice bars as a kid and ALWAYS ordering watermelon and cucumber juice – yum – but I learned that I could probably just make that in a blender…so until I invest in a juicer, I’ll be blending whatever I can. So before this juicing class, but after work, I went on a nice 2 mile run with my best friend. I have been running alone, but it felt good to run with someone else. He definitely kept me motivated and pushed me to do a little sprinting. The teacher of the juicing class is starting to train for a half marathon so we may try to run together. It makes me nervous to think about running with someone that has so much experience but…I wouldn’t mind trying to run a half marathon next year – that would be an epic goal! Also…after the run yesterday, we did a good 1/2 mile walk cool down and a little stretching – but not as much as I usually do…and I can feel it today. I’m definitely going to have to do some nice yoga stretches throughout the day so I can get back out there tomorrow! 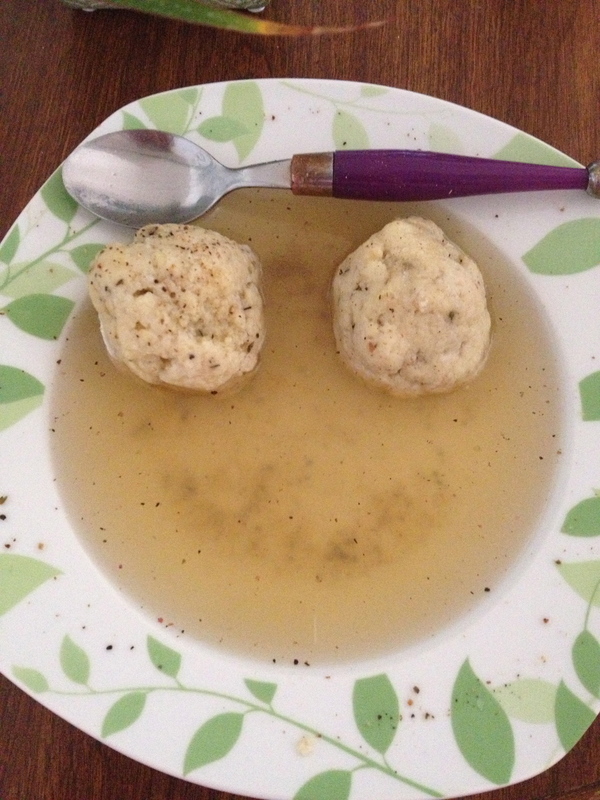 After our run, I heated up some of my chicken broth and some matzoh balls – yumm – and I could eat this every day. It is such a comfort food but also full of nutrients – just add a big salad and it is the perfect dinner! My soup was smiling at me, and I smiled right back at it, and smiled inward to my soul. So cute :) and delicious – I think what made these matzoh balls to flavorful was that I used chicken fat as my oil, instead of olive oil. I also added some dried basic and thyme to the mixture – so those herbs help boost the flavor. Let’s see…what else is going on in my life? I quit smoking cigarettes, after…wow…7 years of light/moderate smoking…I’ll share this story quickly. I tried my first cigarette as a freshman in high school. A friend told me that if I didn’t try it, she’d kick me out of her house…so I caved and tried it – and it was DISGUSTING. But a few months later, and after all my friends started smoking, I just picked up the habit. I was never really “addicted” – I never smoked at work, or at breaks from school (even once I got to college) – it was mostly just when I drove or when I was around my friends…but still, any smoking has consequences on the body. So, for years, I said that I was going to quit by the time I graduated college and I’ve lived up to the goal (and I’m early)! I quit smoking in February and, as of TODAY, haven’t smoked a cigarette in 8 weeks! I’m feeling great and don’t even crave them anymore. The first few weeks after quitting, I had a pretty bad cough and lots of phlegm That has settled down, but since I was congested last week, I feel like this cleanse is pushing out the rest of those toxins from smoking – as I’m still having some phlegm (but now it is clear, instead of dark brown). Studies show that after 12 weeks, your lungs heal themselves and go back to the healthy tissue of a non-smoker – so I’m 4 weeks away, and maybe then I’ll be running like a pro…either way, I’m happy I quit, and I will NEVER again smoke a cigarette. I’m on Day 19 of the Bepure Cleanse and I’m feeling pretty good! I could have used a lot more sleep last night, got about 7 1/2 hours – but I feel like I could sleep all day long. Maybe it is the rainy/dreary weather? Perhaps. I’ve got class after work, before more volunteering at the PFC…so I hope I can get some energy before the rest of my long day drags and after doing some cooking at the coop, I’ll be joining a few lovely ladies for some wine at my favorite Wednesday restaurant – Webster’s (they have a blog too! ).